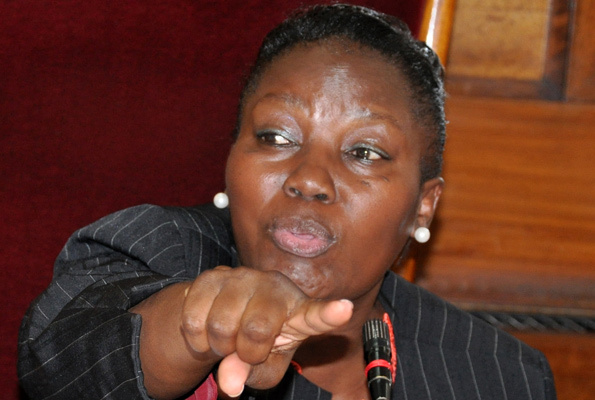 PARLIAMENT – The Speaker of Parliament, Rebecca Alitwala Kadaga, has condemned Makerere University’s leadership structure, saying the country’s oldest public institution is bent on only appointing males and marginalizing women. “I have realised that they are all men, so the entire leadership of Makerere University is skewed,” Kadaga said, alluding to two more male appointments last week of Prof William Bazeyo as the Deputy Vice Chancellor for Finance and Administration and Dr Umar Kakumba as the Deputy Vice-Chancellor Academic Affairs. “This is really perpetuating an imbalance; there are very many structural and institutional imperfections within the university that make it difficult for highly qualified women serving the university to compete and take up these leadership positions,” she added during Tuesday’s plenary. The Speaker then urged Parliament’s Committee on Education and Sports to investigate the matter. “This is in contradiction to the constitution and Principal No. 11 of the national objectives and principals of the state which requires the state to recognise the significant role women play in our country,” the Speaker said. This is not the first time the issue of gender imbalance at Makerere is coming up. In May, former Makerere University researcher Dr Stella Nyanzi expressed concern over the increasing gender inequality at Uganda’s oldest university. Dr Nyanzi raised the concern after the new Makerere University Academic Staff Association (Muasa) administration chart (2018-2020) was released, showing only males occupying all the 16 leadership positions. She wondered why males are still holding many leadership and academic positions at the university despite having many qualified female professors. “How is it possible that in this day and age, the oldest university in Uganda has no woman elected onto the executive of its academic staff association? What patriarchy is this? What phallocentricism allows Muasa to be a leadership organ occupied by only men?” she said. Dr Nyanzi also highlighted the dominance of men in the Makerere administration structure. “The chancellor is a man, the vice-chancellor is a man, the deputy vice-chancellor in-charge of academic affairs is a man, the deputy vice-chancellor in charge of finance and administration is a man and the academic registrar is a man,” she said.